Titre : MOLOKOST - NO LIMIT (intégrale) Extrait de la "11 SEPTEMBRE MIXTAPE"
Titre : NEW // [Ne nous dit pas...] (HD) Molokost & Bigibay "11 Septembre Mixtape"
MADEN'S INFANTRY 11 SEPTEMBRE ENFIN DISPO !!! CLICK SUR LA TRACKLIST POUR TELECHARGER !! 13-EXCLU Molokost & Mou2s mc_ON GERE ! 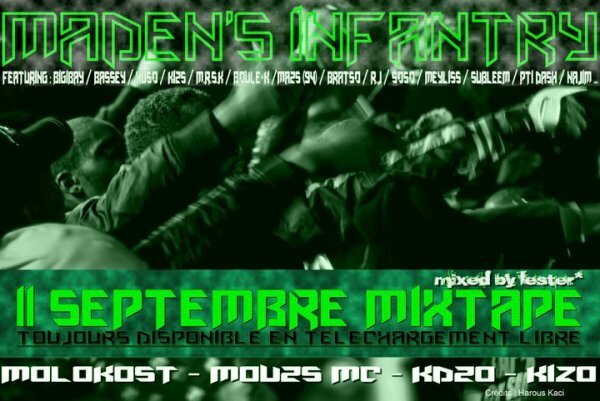 MADEN'S INFANTRY_JE SUIS... EXTRAIT DE LA "11 SEPTEMBRE MIXTAPE"
ON EST PAS MATRIXÉ_MOLOKOST & MOU2S FT BRATSO & PTI DASH MOLOKOST & MOU2S'MC featuring BRATSO & PTIDASH UN SON 100% INÉDIT EXTRAIT DE LA MIXTAPE DE LA MADEN'S INFANTRY SORTIE PRÉVU LE 11 SEPTEMBRE 2010 ! RESTEZ BRANCHÉS !! Titre : Molokost & Mou2s'mc feat R.j M.r.s.k & Ki2s - Faites place ! QUE TOUTES LES MAINS RESTE EN L'AIR !!!! AU PIRE CAR C'EST UN ATTENTAT !!!! SISI WAI WAI !! LA FOULE FAITE DU BRUIT BRUIT !! TROP DANGREUX QUAND ON ARRIVE RIVE !! SISI WAI WAI !! C'EST GOUSSAINVILLE VILLE !! AVANT QU'ON FUI APPLAUDI DI ! !